You'll wonder how your kitchen ever functioned without our Scala Stacking Basket. Designed to stack easily, it allows you to maximize counter or cabinet space. And its clean lines look beautiful no matter where it's placed. The basket's open-front design makes it easy to grab whatever you need. Scala Steel Wire Stackable Basket is rated 5.0 out of 5 by 7. Rated 5 out of 5 by NVWoof from Perfect Pantry Produce Storage Heavy duty baskets, well made and perfect for storing produce. These replaced a purchase of less expensive baskets made less than 3 months ago. Only sorry I didn't buy these in the first place! They perfectly fit on a 12" wide pantry shelf. Although the design is compact the opening is ample making it s very easy to access the fruits and vegetables without having to rearrange and re-stack the shelves each time you retrieve an item. Rated 5 out of 5 by EnglishTeacher from Great for kitchen items I have three of these stacked on my kitchen counter to reduce the amount of clutter I have there. It’s great for veggies and fruit, but it’s also great for storing bags of snacks, bread, jars, etc. Very sturdy and heavy duty! Rated 5 out of 5 by Pcorn from White metal storage I originally bought this to stack but do me the location I was hoping by to use in the bathroom didn't have enough height but I chose instead, the laundry room and it will work great there!! Very well made!! When stacking 2 baskets, what height are the two baskets together? If the basket is 7 and 7/8 inches tall as in the description, which is correct because I have measured it myself, then 2 units stacked together would be well over 15 inches (and not the 14.5 inches in the previous answer). I had the problem of 2 stacked units not fitting in my pantry, so hope this info helps anyone avoid that problem. Best of luck. Is 11&quot; the measurement from front to back, and 9&quot; the measurement from left to right? 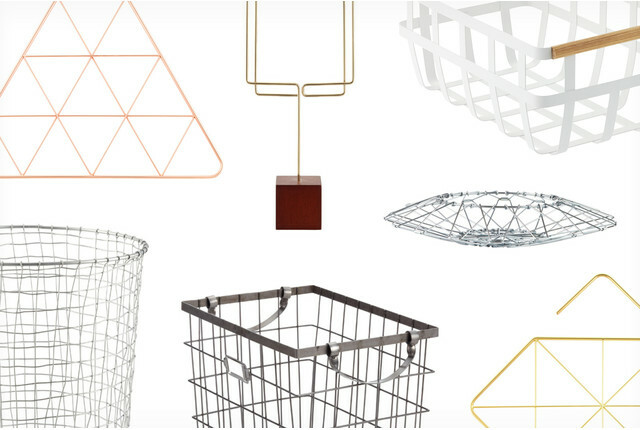 Yes, each of our Scala Steel Wire Stackable Baskets measures 9&quot; wide x 11&quot; deep x 7-7/8&quot; high. Does this come as shown in the picture with 2 stackable baskets? Our Scala Steel Wire Stackable Baskets are sold individually. Is this basket dishwasher safe? Thank you! We recommend hand washing our Scala Stacking Basket and immediately drying with a soft towel. Is this basket large enough to hold 5 pounds of potatoes? The dimensions of each Scala Steel Wire Stackable Basket are 9&quot; w x 11&quot; d x 7-7/8&quot; h.
We'd recommend that no more than 4 baskets be stacked together. Will you make this in gold or rose gold? Looks very practical! I'd love this sort of product in gold or rose gold to match the design of my kitchen/living space. Currently, there aren't any plans to add our Scala Steel Wire Stackable Basket in metallic colors, but we'll keep your wonderfully creative request in mind! Thank you. While "fine lines" are typically something we work to avoid, there's a new trend that just might change your mind about their meaning in your life…and personally, we can't get enough of it.